Magnosco is using Dermatofluoroscopy to detect melanoma. We developed DermaFC as digital second opinion for diagnostic support for dermatologists. The Medical device is supporting (early) diagnosis of malignant melanoma. It allows non-invasive and painless examination of atypical and dysplastic skin lesions using laser technology and AI. Furthermore, we developed a prototype for histological examinations and are currently working on a patient centered software regarding melanoma prevention. 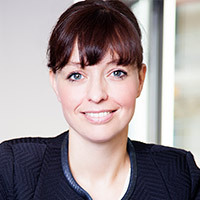 Inga Bergen is digital innovation and digital health expert, CEO and investor. She is CEO of cancer diagnostics and DermaTech Start-up magnosco. Before joining magnosco, she was CEO of the digital health company welldoo. Inga has 12 years of experience in building digital business models and companies. Inga is ambassador for health 4.0/ health cluster Berlin-Brandenburg and spokeswoman of the scientific advisory board for digital transformation of AOK-Nordost, one of the biggest German health insurances.